ShalomPlace.com Shalom Place Community Shalom Place Discussion Groups General Discussion Forums Kundalini Issues and Spiritual Emergencies Kundalini Issues and Why "Is" There A Kundalini (Or Two)? Kundalini Issues and Why "Is" There A Kundalini (Or Two)? First of all, "Why is there a Kundalini (or two) and what is it that is actually real and what is it that isn't real? Phil has spent years studying "The Kundalini" and he has only come across one Kundalini in all of those years. I have spent years studying "The Kundalini" both relative to legend and relative to first hand experience with raising it and controlling it. Why have I done this? Because I am a Christian mystic that wanted to understand what the Hindu yogis were talking about and promoting as an alternative to Christianity (or at best and addition to Christianity). And I have only one Kindalini . And Phil's Kundalini and my Kundalini are two different Kundalinis. The Raja Yoga people and the Kriya Yoga people call the Kundalini that I studied the Male Kundalini or the Golden Snake Kundalini. Which means that there has to be a female Kundalini also. Now the Siddha Yogis teach what they call the "Female Kundalini" and Phil studied in depth their version of the Kundalini. And based on what the Siddha yogis have told me, there is no male kundalini. There is only one kundalini and that it is their kundalini and that their kundalini is female. Now I am going to go out on a limb here by saying that the Kundalini that the Siddha yogis teach takes you into the spiritual areas that are above your head. While the kundalini that I learned can take you into the spiritual areas that we raise our arms and eyes to when we pray. This area lies at a forty-five degree angle up off the top front part of our forehead. And both of these areas are Christian. About legend, There are two medical symbols in today's world and they have a rod or pole that is topped with wings and either one or two snakes winding up this rod or pole. The medical symbol that doctors use has only one snake and that snake is the male or physical body Kundalini. The other medical symbol has two snakes winding up its pole these snakes represent the body physical snake kundalini and the body spiritual snake kundalini which is the other or female kundalini. And then we have the kundalini of the Siddha yogis and it goes up the inside center of the rod or pole that the other two snakes symbols wrap around. The Siddha yogis call this energy that goes up the inside of the pole the female Kundalini. What the Siddha yogis are promoting does not fit legend and it does not fit Eastern thought or tradition. The energy that goes up the inside of this rod or pole is not a kundalini and it is not male or female. Tucker, I do not know or understand how designations of male or female can be attributed to what we call kundalini process. What I call kundalini is not really a type of energy, but an intensification of the flow of our basic life energy (bios, chi, prana), usually concomitant with contemplative practices, and to strengthen/energize the brain/nervous system to sustain contemplative consciousness. I've searched the Internet and my extensive library on kundalini for more info on some distinction between what you're calling male and female kundalini, but I can't find anything. I think you must have come upon a little-known occult tradition, and it's obviously made a deep impression on you. But it's difficult to dialogue about this when our approaches are so very different. Perhaps yogi, bear (God, did I just put these two words side-by-side? ) and others can engage you, here. That is ok Phil it is not on the internet anymore. I guess my point is that the "natural force" that one can harness that goes up the center of the spinal column is in my opinion not a Kundalini unless there are three of them and that it does not have any gender. And to me and the way that I do my meditations there isn't any gender to anything except that of course I do have a male body and my meditations do stimulate a male hormonal system. To me everything is right brain left body and left brain right body. Along with the different areas of the brain that the right and left parts of the brain share. "It is difficult to dialog about this when our approaches are so different." so that brings up the question, "What is my approach and what am I attempting to dialog about and why am I doing this?" Phil I read your book "The Kundalini Process" and it completely changed my approach to everything because a lot of things that I have been trying to understand just fill into place. And this understanding creates a meditation system that works really great. Relative to the "Ancients" everybody is just teaching a different piece of the total system that the "Ancients", for lack of any other term, knew and understood. My goal over the years has been to understand the whole picture and how the different pieces that are being taught today as stand alone fit together as a complete system of knowledge and understanding. The information in your book "The Kundalini Process" and your approach to this information solved the last piece of the puzzle that I have been working on. Everybody says that their system and knowledge is an absolute and they do not understand that what they are teaching is just one piece of the Old Knowledge or System. And if you put all of the pieces together that are being taught today you would still be missing some pieces. The Tree of Life piece of the system, the Center Pillar and the Four corners piece of the system, the Unicorn's Horn piece of the system, and the South American so called Corn God's piece of the system. All of these pieces were scattered to be taught as independent stand alone systems with each having their own symbolisms attached to these different systems. The original Old Knowledge system was just energy flows and points in space with some of these energy flows and points corresponding to the physical body and the nervous system. There was no religious attention or significance attached to any of it. Anyway Phil I think that I am not attempting dialog, I think that I am just really excited about everything and I wanted to tell you. The piece that you wrote about of the big picture and the understandings that you shared brought a lifetime of study together for me personally. The problem is Phil that I can not explain all of this or probably dialog about it because I am in a different world than other folks are. Thank you for your love and patience Phil ! I wholeheartedly agree with your assessment of Phil's latest book. Well written. Thorough. Complete to the point of enlightenment. As to female/male aspects, I actually find quite a bit on the web on the perspective (I just did a Google search using "kundalini male female"). More importantly though are the bio-energetics involved. ...they depict three channels, or Nadi's. Sun (Pingala), Moon (Ida), and Middle (Sushumna). I'm no Yogi and can only speak to the experience. In attempting to make sense of the path, it seems that one first experiences the activation of Ida, and it's everything Phil speaks to in his book. What happens after is where things get dicey... not just in my experience, but in the experience of others who speak to it as well. 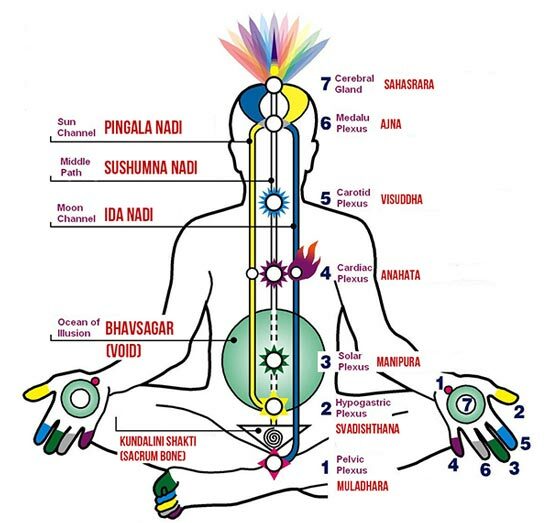 It seems as if Enlightenment then occurs with the initial activation of Pingala, and the resulting meeting of those two Nadi's in the sixth and seventh energy centers/chakras. While the initial experience is life changing, what follows is an expansion of energy throughout the Vasovagal channel. It can be life threatening, and crisis awakenings seem to occur when some life event activates this Nadi before having gone through the preliminary process of Ida activation. This happened to my mom not long after my youngest brother committed suicide (he had schizo-affected-bypolar disorder... never ends well). When she started describing her symptoms I suspected it may be such. As things developed, and doctors put her through upper heart ablation, then other treatments, ultimately resulting in a pacemaker/defibrillator and full heart ablation. In the middle of all this, noting that almost all the 'causes' listed for her episodes were labeled 'syncope', I suggested she ask the doctor about Paxil as an off-use med that's been shown to be effective (it worked for me) in addressing the problem. Ultimately the doctor gave her two months to live... she was down to just under 90lbs, frail, and miserable. She finally asked the doc about trying the med... it's now been a year and a half, she's regained most of her strength, is active, thinking of going back to the gym, and her weight is almost back to normal. Unfortunately, she didn't experience the holistic nature of the awakening of Ida nor enlightenment, though she has read my book and engaged me in a number of discussions on the subject. Unfortunately I don't have any idea how things unfold when Pingala is activated first. You are correct also in that the activation of Pingala ultimately leads one to confront Ego in the most profound ways... it's almost like it forces one to burn through one's aggressive nature and behaviors in very experiential terms. Activating the middle channel (Sushumna) through Spinal Breathing was for me the answer to achieving some semblance of balance and address the rather harsh energy and driving nature of Pingala. By the way, your suggestion some time back to drop the energy into the heart chakra vs the solar plexus chakra was very effective in calming things. Thanks! aspirant for unbroken meditation on the Absolute through a penultimate step of concentration. Usually, kundalini shakti (energy) is depicted as female, shakti being female, Shaktism (worshiping the goddess) being one of the major spiritual paths of Hinduism. The goal of kundalini yoga is to awaken and raise this energy and unite it with Siva, or Pure Consciousness, which is a masculine principle. Male and female kundalini probably are related to different practices or paths to awaken and guide kundalini, some of which we can label masculine and others feminine. It probably corresponds with Ida and Pingala symbolism posted by Les. I think that we can call the kundalini raising the same as the process of spiritual growth, but from the energetic perspective. Personally, I don’t like separating the kundalini problem from general spirituality. People often relate kundalini to energetic aspect, and especially the painful manifestations of kundalini, and they don’t pay attention to the fundamental issues, which I think Phil is trying to suggest, and I can agree with that approach. There are different paths, like bhakti (devotional) yoga, jnana yoga (yoga of philosophical discernment), karma yoga (yoga of action), and I think it would be wise to gain knowledge as much as possible from all of these paths. One additional problem with kundalini, or symbolism in general is that it is often not easy to understand, coming from another realm, whether we call it divine or collective unconscious. Here the study of symbolism, philosophy and comparative religion is of great help; perhaps I can suggest studying Carl Jung, although I have many issues with him. By the way Jung had a lot of blunders in his book on kundalini. What I think is important is to listen to the images, hunches, attitudes, ideas coming from our inner world, then to understand them, and after that to integrate them, which is even more important than understanding them. These problems, if I may suggest again are quite often related to our posture, breathing and muscular patterns, which would be another aspect of the issues aforementioned. From my experience with teaching people Hatha yoga, I know that changes in energy, emotions, breathing can be produced just by simply stretching the psoas muscle for example, or hamstrings for that matter. Perhaps tight hamstrings can be the cause of the pain in the back of the legs that Tucker mentioned? There are also emotional issues related to muscles. If I remember correctly, member Acuveda mentioned that she was able to stretch her hamstrings much better after resolving some emotional issues. Or, Gregor Maehle writes in his book on Ashtanga yoga about "emotions locked in the hamstrings". You are welcome about the suggestion Les and Les your pictures are an extreme gift to what I was trying to say and to understanding the original purpose of this topic. Your second picture shows the two snakes, male sun physical pituitary and female moon pineal spiritual. Your first picture shows what it calls the middle path which is up the center of the spinal column and it is not a serpent. There are three! Yea! And the two snakes are the Kundalinis traditionally because they are snakes. Yea again! As you can tell I am really excited about this . Now what I have done is to bring the two snakes up to the area between the eyebrows and the energy in the Sushumna (apparently it is also a Kundalini according to some traditions) up to the area that the second picture calls the Bindu Godhead. From there I took the two snakes the Pingala and the Ida along with a branch of the energy from the Sushumna out through the area just above the eyebrows up into the Source which is located at a 45 degree angle up off the center of the upper part to the forehead (the Unicorn Tradition and the Tree of Life Tradition along with the branches of the Tree of Life also being the area that they are calling the Bindu Godhead). And I am holding and feeling everything in place with my minds eye so that everything is taking on mass. Should this post have a warning to the folks at home? I don't think so because there is nothing dangerous in it. All of the stuff that is really dangerous is very secret and the folks at home don't have access to it. Everything that is posted in this post is just skimming the surface of what you actually have to do with the understanding that the rest of it is considered secret. My book was an effort to demythologize the kundalini literature and present an understanding that was not so grounded in occult anthropologies. I see they are alive and well in this discussion, however. Let us first be clear that when we speak of manipulating energy through various ascetical exercises (kriyas, breath, asanas, etc. ), we are dealing with a natural phenomenon, for God is always beyond our attentional and ascetical manipulation. That said . . . all these maps about energy movement patterns, including chakras, nadis, etc., are, to my understanding, simply ways of speaking about how our basic life force (bios, chi, prana, etc.) is transmuted to psychological and spiritual energy and then how it moves through the physical, psychological and spiritual levels of our human nature. It's pattern of movement treks first and foremost along habitual patterns of attenion, which is why spiritual practice is so essential. In fact, any energy that is aroused and intensified and "moved" this way or that cannot and will not be sustainable if there is not a concommitant change in attentional patterns. That is why the practices of loving God, forgiveness, honesty, etc. are so important; without these foundational virtues, moving energy around can become a quest in the service of the Ego, which can indeed become incredibly inflated, even to the point of believing it has "realized" divine consciousness. From the Christian p.o.v., this contention is always to be considered the highest nonsense, for God's "consciousness" (if we may even use that term) is always beyond the human, always unattainable, never something we can "realize" through our efforts, and yet, always generously self-giving to those who are poor in spirit and pure of heart. My sense is that these various maps and snakes are naught be symbolic expressions of how the intensified life force moves through the central and autonomic nervous system, which is further divided into the Sympathetic and Parasympathetic Systems (kind of a yang and yin, of sorts). The CNS is the brain and spine -- a straight channel; the autonomic winds its way around the spine and body. The CNS and ANS represent conscious and unconscious functioning, respectively, and the intensified, spiritualized life force we call kundalini flows through and cleanses both to sustain higher contemplative consciousness. The flow can be a "mess" at times for the blockages to be overcome are many, and quite noticeable -- even painful.. Surely the flow through the CNS has a different feel than what's going on in the ANS, the latter seeming to be foreign and impersonal. Stimulation of the Sympathetic part of the ANS is yangish while the Parasympathetic is yinnish, so maybe that's partly what this male/female designation of kundalini is about? In Christianity, there are no "secrets" to knowing God and growing in the divine life -- no secret practices, no secret knowledge, no secret groups that hold a key to enlightenment, etc. Whenever that stuff has developed, it's gone off the rails and has been denounced. Why? Because all was plainly taught by Christ and his gifts of Church and Spirit continue to bless us with what is needed to advance in our participation in divine life. The signs of this participation are many, including loving service, justice and wisdom. To my understanding, as most of you know by now, the Spirit is not the same as kundalini, though the two can indeed dance together. So we seek to live by the Spirit, and if the kundalini process awakens, we submit it to the guidance of the Spirit and let it find its way accordingly. Excellent suggestion, yogi, as is your point about breathing and posture, and how this influences energy flow. and to plunge in meditation. Yes, same as Zen, which speaks little of kundalini, and when it does, somewhat unflatteringly. Both systems focus on attention and trust that energy will flow accordingly. Good to have you back, Les. In light of my post above, do you think the reference to male and female kundalini could be referring to how the Sympathetic and Parasympathetic parts of the Autonomic Nervous System are being stimulated? Tucker, it's always fascinating to read of your insights and practices. It's curious that mystics often seem to be looking up toward that "place" you mention, "45 degree angle up off the center of the upper part to the forehead." I am led there as well sometimes. It has a good, solid, integrative feel. Thanks. I do enjoy these discussions, even when perspectives don't always agree ...though often, it just comes down to the difficulty in discussing such things. From a purely scientific/bio-energetic perspective, yes. I never thought of the experiences as female or male, but rather as shifts in consciousness and resulting changes in physical experiences. 3. the harsh experience that eventually follows as a means of purification. While I had control during the first part, the third part was more 'fight or flight' in nature. The latter part is what really brought me back to Jesus' teachings in the search for clarification. There are many truths out there, but none as complete or thorough. Phil, regarding the Autonomic Nervous System, perhaps I could suggest reading “A Physiological Handbook for Teachers of Yogasana” by Mel Robin, it is an excellent book with hundreds of references from scientific studies, and it has a whole chapter on ANS. I think it is obvious that SNS and PNS can be related to male and female, this is one of the basic polarities of human nature, whether we call it Yin-Yang, or as yogis call it Sun and Moon. This problem of these two fundamental energies and their relationship has been tackled by philosophers (Christianity in the beginning also being referred to as a philosophy) for thousands of years with different solutions, quite often in accord with the type of a person. Here is the interesting question: Do we ascend from the dominant function, or from the inferior function? If I have a strong intellect, do I ascend from the intellect? Someone might suggest that there‘s lack of love, and not intellect? It was Jung’s thesis that we advance by the inferior function, by balancing the existing imbalance, something like “golden mean” of the Greeks. “To an intuitive-intellectual the source of the revelation is the body” p191. “Intuitives are always ahead of themselves, never quite in the here-and-now, because they are nosing out possibilities which are to come off in the future. The body is here-and-now par excellence, a prison in which we are here and now; but intuition is that faculty which removes one from the here-and-now in space and time” p190. There is truth in these words of Jung, the intuitives quite often despise the body, and are often sick because of a sheer lack of attention for the body. The intuitive type has to understand that knowing the body, physiology, breathing, energy is important, not for some hedonistic reasons but for instrumental reasons. Thanks for your follow-up, Les. I guess whatever brings one to Jesus is a good thing, and for sure the Holy Spirit works in many ways. Yogi, thanks for the book reference. I have a M.S. in biology with all the coursework for Ph.D., and so had extensive training years ago in how the nervous system operates. When, years later, I came upon teachings about yin/yang, anima/animus, etc., it seemed this was referring to balance between SNS and PNS, at least to some degree. The physiological dimension of this is one thing, the psychological and spiritual experience of it another, and they are all related. E.g., we can trigger fight-flight with our thoughts (activating SNS), then calm ourselves with some meditative process (PNS). CNS and ANS are like the hardware; psychology and spirituality the software that interacts with it. You ask: Do we ascend from the dominant function, or from the inferior function? If I have a strong intellect, do I ascend from the intellect? Someone might suggest that there‘s lack of love, and not intellect? I'm not sure I understand the question in its reference to "ascend." Do you mean spiritual growth? I'm quite familiar with Jung -- have even taught an online course on his personality types in relation to spiritual growth. I also had a dear friend who was a Jungian scholar -- Jim Arraj. My sense is that his teachings on individuation are charting a different developmental process than what the teachers on mystical spirituality are describing, though the two can and should go together. The kind of integration that Jung speaks of is extremely important, and can even be helpful in dealing with kundalini issues. I'm also an intuitive type: INTJ. Yes to your comment on the importance of being in touch with the body! As you note, it's always in the present moment, not to mention an indispensable part of our human nature. Guys your posts are just awesome! I feel like a child amongst adults . Phil, the reason that I studied Yoga Science as a Christian mystic was because I wanted to know what the yogi folks were offering Christians (back in the seventies and eighties and still today) that Christians couldn't find in Christianity. The yogis were promising an attachment to God that could not be found in Christianity. Pay your money, study our stuff, and all will be solved. I studied the science that all yoga traditions and other systems of awakening are based on along with their teachings and meditations to see how they related to yoga science (the science of achieving "union") and I am now a master that can sit with any yoga master of any tradition and talk to him or her mind to mind. What does all of this mean? It means nothing ! Because, I am not a teacher or guru, I am just an old mystic. Phil your book was a gift to me because it helped me to reach the pinnacle of my lifelong studies which is apparently something that I can not explain to you guys . I am now also a master of energy flow in the human body and mind. And, from now on all I have to do is practice something that has to do with maintaining a physical body over time and absolutely nothing to do with religion. I already had the relationship with The Father, The Son, and the Holy spirit, what I didn't have was the complete understanding body physical's energy flow. And your book Phil gave me the last piece of the puzzle. The Sushmna Nadi and how it related to everything else as a system of energy flow. All you have to do is become one with the first picture that Les posted. From there you just have to deal with the "Ocean of Illusion (The void)" That is where all of your so called Kundalini problems come from or originate. And once you understand that you can just skip that area and not put thought into it everything else just falls into a state of balance. What you put thought into wakes up and is activated. The more thought you put into it the more it is wakes up and is activated. Everything in the first picture are the must areas to put thought into and to keep awake except the "Ocean of Illusion" because that is the area that starts to shut down the physical and mental system when it is activated. It should be kept in a state of idling quietly. And Phil what I just wrote has nothing to do with what you are saying in your book, it has to do with maintaining the body physical in a state of existence. Thanks for the link Phil, I haven’t yet discovered that part of the site. And yes, by “ascending” I was talking about spiritual growth. Now, when I think of it, the word “spiritual” can be interpreted in several different ways. Also if we think of atheists then perhaps for them the ascent could be interpreted as an emotional, intellectual, behavioral growth, resembling Jung’s individuation, which sometimes can flow together with spirituality, but sometimes can be the exact opposite of spirituality, I agree with your point that it is a different process. Psychological equilibrium sometimes can be literally the death of spirituality. Being centered in God and being centered in psychological equilibrium are two different things. I would advise Christians to be careful with Jung, and especially with other psychologists like Freud and Adler, because they are as a rule based in lower nature, which is the exact opposite of traditional spirituality. For the historical development and meaning of spirituality and spiritual exercises I could perhaps suggest to everyone a wonderful classic by Pierre Hadot “Philosophy as a way of life”. So yogi, what kind of experience do you have with opening the water lily flower in the area over the top of the head? If a yogi sits in an open water lily flower and then opens up a water lily flower in the area just above the top center of the head and holds that meditation it wakes up in a balanced way all of the energy centers of the nervous system that are in between them. And if bottom tip of the tiny root that hangs off of the bottom center of the open lily flower almost touches, but not quite, the top center of the head the yogi will begin to experience bliss. The key Phil is that you have to hold your grounding meditation. The open lily flower that the yogi is gently sitting on/in, gently floating in it, is the ground. It is the Cathode. From there once you open the flower over the top of the head while holding the grounding meditation the flower over the top of the head becomes the Anode which then automatically sets up a energy exchange between the two plates that energizes in a balanced way all of the body's nervous system that lies between the two plates. And if you add the tiny root almost but not quite touching the top center of the head you will begin to feel bliss. If the goal of Raga Yoga was to teach one how to achieve a spiritually enlightened state then this meditation is all that they would have to teach. So Phil , What is Christian Yoga (Yoga means Union with or Yoked to)? The Hindu and the Oriental (which includes the Buddhist) folks claim, generally speaking, that they have something a system that Christianity does not have that leads to enlightenment. And that if one who is a Christian wants to experience enlightenment (and maybe bliss) that they have to study their non Christian way under their masters. And generally speaking, their way says that God does not exist, or that you are God waking up to yourself, or that one has to worship a different god or gods. Not ! Quick Reply to: Kundalini Issues and Why "Is" There A Kundalini (Or Two)?